Hypertext 2010 is coming next June in Toronto. If you’re a hypertext researcher with a weblog, I’d be grateful if you’d link. Not just for the usual reasons, but also because last year’s HT09 web site still has more Google juice for the query "Hypertext 2010", and while that’s understandable after the standing-room only success of Torino, it’s inconvenient for everyone. Want to talk about a paper idea you’re thinking about? Feel free to Email me. Also on the conference front: Gene Golovchinsky thinks we should reward good reviewers. For Thanksgiving, I tried making kahk bracelets. They’re small, crunchy dough circles, something at the light end of the pretzel family. I thought they’d go nicely with football, and we certainly seem to have sold plenty of them. I made the kahk from Claudia Roden. I’d never heard of them before, much less tasted one, and as Adam Gopnik points out in his wonderful New Yorker essay on cookbooks, not knowing how something ought to be is sometimes a recipe for kitchen confusion. My mother and her mother emigrated to Shanghai from Iraq in 1930. My grandmother had been widowed many years earlier. Over the intervening years, her three older children had all found their way to Shanghai, and her only son, Jason, eventually sent for Granny and my mom once he was able to support them. At the time, thousands of Iraqi Jews resided in Shanghai, one of the most cosmopolitan cities in the world. The Iraqis did what they could to maintain their customs. Granny, the widow of a rabbi, went to synagogue twice a day. We all lived together in her one-room apartment during World War II. Granny was a fabulous cook and baker. Her kitchen only had room enough for one person, so my mother wasn't able to learn from her. What my mom and I remember best are the smells, tastes, and textures of Granny's food. The two pastries that stand out as the sine qua non of her repertoire are kahk and cheese sambouseks (see page 111). When my family immigrated to San Francisco in 1950, we had to leave Granny behind in Shanghai. She eventually traveled with my uncle Jason and his family to Israel and then to Canada, but she died without us ever seeing her again. With this in mind, Women’s Lens was created to inform and present a woman's voice to the Diaspora. 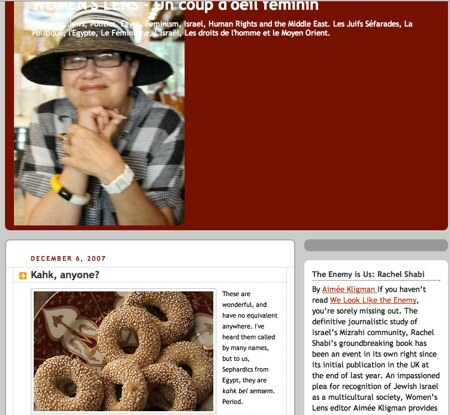 I explore anti-Semitism, Israel, socio-economic issues and their effect on women worldwide. We also look at culture, not only our own, but the ones that have had a great effect on our traditions. Since, for a lot of us, French was our native tongue, many posts on Women's Lens are in that language. Inevitably, there will also be narratives peppered with some Arabic, Spanish, Ladino and any other language that may have enriched our lives. and she’s got kahk, too! I remember when my mother used to bake, she used to make two varieties; this one and a sweet version. She had those huge, square black baking sheets (saneya) that our maid used to put on her head to bring them to the neighborhood ovens. Most of us middle class people didn't have our own ovens. So, the maid would pile 3 or 4 of these sheets on her head and walk over there and sometimes, I would get to accompany her. When she came back, my mother would store these in huge "bartaman", which is a glass container too large to be called a jar. They would keep for a few months. She was an awesome patissière. Adam Gopnik explores the evolution of cookbooks, from Escoffier’s dictionary to Julia’s encyclopedia and on to the modern cookbook which is a grammar. It’s an important essay. Your grandmother’s pound cake may have been like concrete, but it was about a whole history and view of life; it got that tough for a reason. Gopnik is right about the grammar, though perhaps unintentionally so. I suspect when he thinks of grammar he’s imaging worn prescriptive textbooks that coerce students to follow rules: no dangling participles, add the liquid ingredients to the dry. 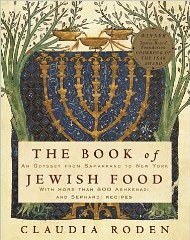 But the best of the New Cooking is grammatical in the deeper linguistic sense: not rules to follow but an index of possibilities, connections and linkages, a guide to what can follow a dish, a hint of how to distinguish the eloquent from the merely adequate. After reading hundreds of cookbooks, you may have the feeling that every recipe, every cookbook, is an attempt to get you to attain this ideal sugar-salt-saturated-fat state without having to see it head on, just as every love poem is an attempt to maneuver a girl or a boy into bed by talking as fast, and as eloquently, as possible about something else. 'Shall I compare thee to a summer’s day? / Thou art more lovely and more temperate' is the poetic equivalent of simmering the garlic with ginger and Sauternes before you put the cream in; the end is the cream, but you carefully simmer the garlic. Garlic, ginger, Sauternes. Damn: it’s Thanksgiving. Now, where am I going to find Sauternes? Over in the Tinderbox forum, J. P. Bogers MD Phd asks why software companies are cagy about release dates. Why isn’t Tinderbox 5 out yet? Why don’t well tell you exactly when it will ship? When I build a house, the contract mentions a delivery date (and even a fine when this is not met), when I buy a car the same. As a medical professional I run a lab with thousands of tests each year and the QA system only allows a small percentage of specimens to be answered after more than a specified number of days. New houses are built every day. Before the builder picks up a hammer, there are detailed plans and specifications that indicate almost every detail. And, though your house may be unique in overall plan, nearly everything in it has been built into houses before. Tinderbox is a personal knowledge assistant for visualizing, analyzing, and sharing short, textual notes. There have been other systems with similar goals, but they are not numerous. I have probably met the majority of the people who have ever designed a system in this area. In many ways, this more closely resembles 18th century natural history, or 19th century medical research, than managing a medical testing lab or a house construction site. Software development is made still more complex because we have not yet discovered an equivalent to trim -- the myriad tricks and conventions that allow a builder to make substantial errors in measurement and constructions without damaging or complicating the final product. 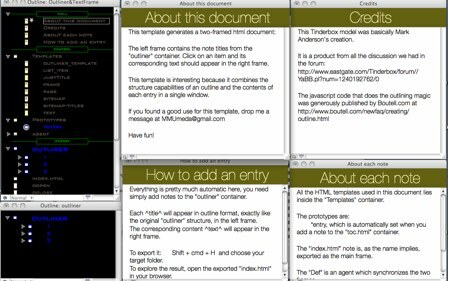 At Tinderbox Weekend dinner last night, we were talking about the original design of Tinderbox's export templates. I had developed what I thought to be a very clever scheme for HTML export based on a declarative language (something like CSS, which had not yet been invented) augmented by machine learning. I presented this to Jocelyn Nanard, on whose work at Montpelier the AI component was based. She listened patiently, said at once that she had a better idea, and set out the outline of the current export template approach. We wound up with quite a few distinguished researchers -- M and J Nanard, D Schwabe, F Garzotto, R Trigg -- around the table for an impromptu seminar. And we didn't get close to today's design. None of us really foresaw how large an export language people would want to have, and so tags multiplied over time. We did not anticipate how useful agent actions would be, and so we didn't anticipate that the template language could depend on the action language. Nobody mentioned the envelope-letter idiom, which turns out to be central to really effective export definition. And nobody talked about performance. I knew that Tinderbox would be built around attribute-value lists with inheritance, but I hadn't discussed this much that evening. It didn't seem to be the right concern for this group. My rough estimate of the number of inheritance-tree dereferences suggested that performance might, perhaps, be acceptable. My back of the envelope calculation was orders of magnitude off; only when the system was running did we discover that exporting a complex weblog design like this one might well require a million attribute references. Conversely, I didn't then know that we'd be using prototype inheritance; I don't think Noble's book was out yet but in any case I hadn't read it. I do recall talking with Nanard about the nice performance of the new PowerPC processors for recursive descent parsing. Of course, we no longer depend on those processors -- and we don't use a recursive descent parser for export template anyway. When a construction project falls behind, you can often add more workers to catch up. Not always, but often – and we have excellent tools for knowing when we can add those workers and were they will do more good. When a testing line falls behind, we can add instruments, or increase their throughput, or build and staff a second line. None of this works in software. At the first hypertext conference in 1987, we had a keynote from Fred Brooks Jr., then incredibly senior and aged, a sage who literally wrote a book about this problem. He’s still talking about it – I heard him again at OOPSLA right before my NeoVictorian sermon. We still have no good solution. In our development schedule, as it happens, there’s a task called The Bogers Email Crash, which originates from an email Dr. Bogers sent some time ago with respect to Tinderbox's email features. The original report seems simple: receiving a particular email crashes Tinderbox, which of course it should not do. But in the event, we believe the problem lies in (of all places) a facade of the thread manager, a legacy multitasking controller on which parts of the POP protocol stack depend. And so we need to explore this notoriously intricate corner of the framework and operating system to find an issue that isn’t even our fault, code around it, and fix it — without breaking anything else. Finally, systems sometimes interact in complex and subtle ways, or raise design issues nobody anticipated. At Tinderbox Weekend yesterday, market researcher Tom Webster described a terrific approach to qualitative analysis coding that in which he explodes a transcript into elements, makes aliases of the elements, and drops them onto adornments as a coding gesture. These features work together very well indeed, but they weren't designed for this. Aliases come from a rejected Web Squirrel design, returning to one of Doug Engelbart's ideas from NLS by way of the old MacOS Finder. Adornments come from Trellix, thanks to a terrific talk by Juliane Chatelaine, but the idea of adornment actions was not in the design or the design rationale and was, I think, an end-user suggestion. The details of the gesture -- being able to drag aliases out of agents, the impact of aliases on the mathematics of map updates after deletion, the distinction between extrinsic and intrinsic attributes -- all depend on ad hoc research that had to be conducted in the middle of development. It takes time because we don’t yet know what we’re doing, because nobody has done this before. A question for my colleagues: were aliases in the Dexter model? I can't recall, and I've got a Tinderbox Weekend session on Tinderbox export techniques to chair in a few minutes. Email me. Most museum stores are deplorable, especially those noisy souvenir stands they throw across the exit of costly blockbuster exhibits, touting coasters, toys, and playing cards as accessories to the elegant life. I’ve noticed lately that some of the larger contemporary museums, notably San Francisco and Chicago, possess stores that one might choose to enter. 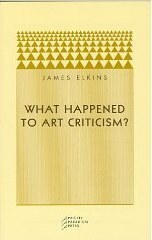 [the] fascinating mystery that art criticism has turned so abruptly from the engaged, passionate, historically informed practice it was before the late twentieth century, into the huge, massively funded but invisible and voiceless practice it has effectively become. Critics seldom know who reads their work beyond the gallerists who commission it and the artists about whom they write: and often that reading public is ghostly precisely because it does not exist. A ghostly profession, catering for ghosts, but in a grand style. Tinderbox users will find a resonant chord in this passage from Franco Moretti’s intriguing notes on the history of the novel, Graphs, Maps, Trees. 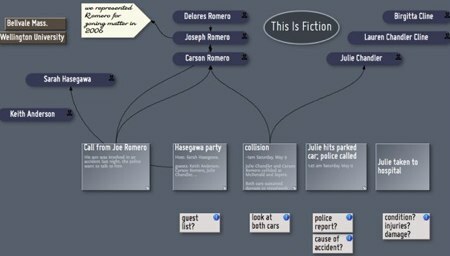 What do literary maps do... First, they are a good way to prepare a text for analysis. You choose a unit – walks,lawsuits, luxury goods, whatever – find its occurrences, place them in space...or in other words: you reduce the text to a few elements, and abstract them from the narrative flow, and construct a new, artificial object like the maps that I have been discussing. And with a little luck, these maps will be more than the sum of their parts: they will posess ‘emerging’ qualities, which were not visible at the lower level. When people discuss American Football these days, it feels like the way people talked about baseball thirty years ago — repeating maxims and rules of thumb that turn out to be untrue. People used to think stealing bases was a lot more useful than it really is. They used to think that walks were meaningless. They used to argue endlessly about whether a low-average power hitter was better than a high-average slap hitter. We know this stuff now. In football, we’re still in the bad old days. Take Belichick’s decision last night to fo for 4th and 2 on his own 28, with the game in the balance. This morning, everyone is assuming it was a wild gamble and a blunder. Nonsense. It’s almost certainly the percentage move on average, and it’s even more clearly the percentage move in context. The Patriots make the first down (winning the game) more than half the time; the league average would be about 60%, the Patriots are better than average, and the Colts defense was tired and is probably not much above average against 4th and 2. So, you're trading a 60+% shot at winning the game right now, for 40 yards of field position with lots of time left, a tired defense, and Peyton Manning waiting on the sideline. Actually, it wasn’t quite all the marbles, since the Colts had a couple of timeouts left. Still, you could burn all their timeouts and the 2-minute warning and some additional clock. If you don't get another first down, perhaps you run all around the field and waste a lot of time and take a safety and get the free kick. In any case, it’s a big pivot. And, in point of fact, the play did work; the refs appear to have blown the spot. Everyone “knows” that you don’t go for 4th-and-short on your own side of the field, but I’m pretty sure that everyone is simply wrong. I came upon a large man with two children in tow, all bundled against the cold in parkas and scarves and hats. He asked if I had a minute, and I immediately knew what was coming. Sure enough, it came out: the request for a dollar, some change, anything I could spare. I glanced at him, at the children, back at him. Something for bus fare, he said. They’d missed dinner at the Mission the night before, he said. Just a little help, anything I could do, he said. How many times had I heard this before? A brilliantly-written, charismatic chronicle of the chronicler of Broadway, written by one of the last men to fill Runyon’s shoes. Runyon came to New York and covered the Giants for the American; the Giants left for California and Breslin stuck around to write about the Amazing Mets. The best book about Runyon is Jimmy Breslin’s slightly dispiriting biography, published in 1991, one of those “matches” that make a publisher feel wonderful until the manuscript comes in. Writers train for one length or another, and Breslin’s is essentially a series of eight-hundred-word columns strung together, all told in that good Breslin style, where this guy said that to this other guy—quick glimpses of Prohibition, the Hearst press, stealing coats in the Depression—so that the total effect is like watching the world’s longest subway train go by at night. And he is not wrong, though perhaps that longest subway train is a slight exaggeration. 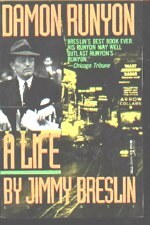 But Breslin has a nose for the story, and Breslin’s big story — the transition from Prohibition Manhattan, where friction was about money and religion, to 1960 New York, where everything was about race – fits nicely with Runyon’s, and the opening segue, from the archives of the University of Texas to the old Hearst newsroom and a dingy Manhattan apartment filled with cops and reporters, is a thing of beauty. Marcello Mirage Umeda has crafted a nice Tinderbox demo that exports an HTML outliner that works a lot like Tinderbox's explorer view. It's a handy and general technique for sharing hierarchical information from your Tinderbox document through the Web. Also: a nice example of using a dark color scheme in Tinderbox! Download it from the Tinderbox Public File Exchange. And on the Tinderbox Forum, there's an interesting discussion of Tinderbox and narrative models. And another discussion of Tinderbox maps as a whiteboard. Meanwhile, Steve Winnick takes The Romero File in new and disturbing directions. I'm a little late on this, but it’d be good to record the menu before I forget it entirely. I wandered into the weeds early and never quite got out of them. This was especially unfortunate because I’d opted for the turkey because we had a crowd and I wanted something reliable that would require no fuss. As it played out, the turkey started late, we sat down to dinner late, and in the end the turkey ran just a little over. There’s a new episode of The Romero File, the ongoing (and dramatic!) Tinderbox map tutorial. And Steve Winnick has a new response, tackling the same issues and using Tinderbox from a lawyer’s perspective. 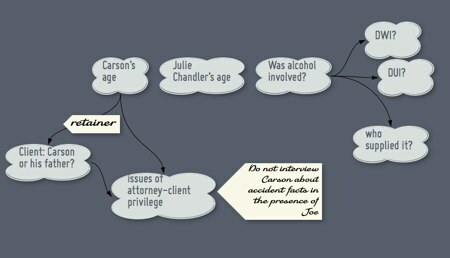 This is a very quickly sketched map, based on the facts developed from a couple of phone calls in a routine legal matter. Two high school kids leave a party separately. Somehow, they manage to get into a minor accident. No one’s hurt, the cars are dinged, their parents are going to be angry. They drive off. Later, one of the kids drives into someone’s mailbox — which, unfortunately, it set in concrete. She’s not badly hurt, but Mom’s BMW sustained further damage. There’s a police report, an insurance tangle, and the police want to talk to her boyfriend – presumably about the first accident. At Steve Winnick points out, even this simple picture offers all sorts of questions. How old are the kids? Could alcohol or drugs be involved? What are the dramshop liability questions that arise? How are we going to sort out the damage from the first accident from that incurred in the second? And who is going to be paying our bill, anyway? And, already, we’ve got a large and growing cast. Two kids. Their parents. The host of the party, and her parents. And the guests at the party – both invited and uninvited. The police officer who filed last night’s report, and the desk sergeant on duty this morning. The doctor who treated the girl. The insurance adjusters for both cars. And, if this actually becomes a case, we’re going to have attorneys for the kids, the host, both insurance companies, a DA, and who knows what else. After that, things might get complicated. The key points are that you’ve got to write stuff down – facts, contacts, theories, queries — and you can’t know yet how they ought to be organized. You need to keep track of contingencies. For example, we aren’t sure how old the kids involved are; if they’re minors, all sorts of new issues arise, and we don’t want to forget those until we’re sure of their ages. So we need to keep things connected and keep things organized, even though we are always aware that we may need to change those connections and reorganize everything tomorrow. Last night for dinner I fried up some leftover patties of homemade duck sausage and served them on small round brioche bits that were bread pudding remnants. Tasty! Speaking of sliders, Kottke and Gruber and all the cool kids are cheering on Neven Mrgan’s protest against all the different kinds of slider to be found in Photoshop. I love Photoshop. It’s where I spend eight hours five times a week. I just wish that one of these days, instead of piling on more furniture, they’d clean up the place. This is why we get beautiful, shiny, polished programs that do the same stuff you could do in 1994. They attempt nothing new, but they sure have lovely detailing. Sure, the proliferation of slider styles is mildly inconvenient and it’s a code smell. I bet fixing it would only cost $100K. Maybe $250K, worst case. It might be worth doing, if Adobe has the money and the talent. But is this what we want most? Notice how the iPhone has a ton of tower defense games with lovely graphics, and hardly one game that’s new? Notice how we’re still waiting for any real use of augmented reality? Or location-specific software art? Why can't we have a better computer press? Over at Winvictus, attorney Steve Winnick is working through the Tinderbox tutorial, The Romero File. In the tutorial, the initial Tinderbox map focuses on what happened. Winnick focuses more closely on the legal issues the case presents. 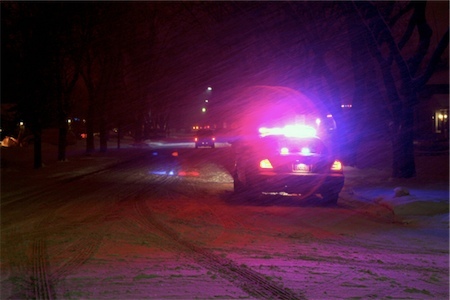 Even though it begins as a fairly routine matter of a minor traffic accident after a high school party, we can identify quite a few questions – some of them far from routine – even in the opening minutes. Steve lays these out in lists and outlines, and that works well. Some people find fast information maps like this one more congenial than lists, though some vendors extol their virtues unreasonably. The chief advantage here could be ad hoc conceptual clustering, or perhaps the opportunity to represent dependences one might later forget. For example, Carson Romero’s age is interesting both because he might have been an underage drinker, because attorney-client privilege of a minor needs to be carefully thought through, and because the attorney naturally would like to know who will be paying the bills. R&D: a sidebar about research issues, either topics for future research (attention graduate students!) or pointers to key studies that should be better known. Separately, attorney Steve Winnick is taking the fact picture from Romero and describing his own approach to building a Tinderbox map. His first step is Getting a Grip. 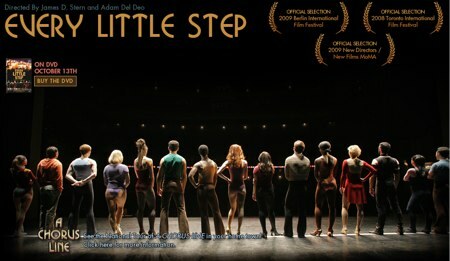 Recommended: Every Little Step, a documentary about casting the recent revival of A Chorus Line. A fascinating look at people who really need this job, and at how the play was created from an evening of tape-recorded interviews and years of workshops in an era before workshops. Notice, too, the amazing skill and polish of many who don’t get the part. Diane Adams argues that you should smile when you receive a negative blog comment. I’ve long argued that weblog comments are a time bomb — that nobody can withstand a truly talented troll. The title story is a great story, of course, and White’s writing is famously so crisp and engaging that it hardly matters whether he is talking about forgotten poets or nasal surgery in time of war. The unmissable chapter here, though, is White’s unforgettable preface to Roy E. Jones’ A Basic Chicken Guide for the Small Flock Owner. What a stroke to ask White to write the introduction! And what an introduction he wrote. Although I refuse to believe that she is a silly creature, I will admit that the hen is a rather unpredictable one and sometimes manages to surprise even an old friend and admirer like myself. Last December, after about sixteen weeks of collecting eggs in my laying house without causing any undue alarm among the birds, I went in one morning wearing a wrist watch my wife had given me for Christmas. I opened the first deck of nests and thrust my hand under a hen to pull the eggs out. The hen took one look at the watch and shrieked, “A time bomb!” Instantly the whole house was in an uproar, with hens trampling each other in a mad rush for the corners. This sort of panicky behavior causes some people to regard the hen as a silly creature.